While no release date has been confirmed yet, the Giant Edition will bring the original game plus the Reign of Giants expansion to Sony's handheld. Following numerous fan requests, developer Klei Entertainment has announced their indie survival game Don't Starve will soon be heading to the PS Vita in the form of Don't Starve: Giant Edition. In a post on the PlayStation blog, Klei could not yet supply an exact release date other than to confirm to fans that "it's happening." The Giant Edition will include the original game, the Reign of Giants expansion released this past April for the PC version and all of the updates currently available on the PC and PS4 editions of the game. This includes an "Adventure Mode," which tasks players with surviving multiple, randomly-generated worlds. The Reign of Giants expansion added new seasonal challenges and playable characters to the game, as well as, you know, giants. The Vita version has also been designed to take advantage of the console's touch features for navigating menus and crafting screens. 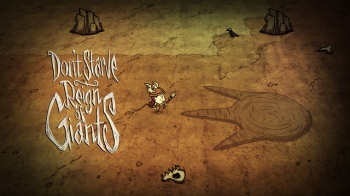 Klei also wrote that they were working on the final touches to bring Reign of Giants to the PS4 version of Don't Starve.